International airports usually feature duty free shops that sell liquors, perfumes and other luxury items to outbound travelers. These items are called "duty free" because travelers do not have to pay customs taxes, or duties, on their purchases because the travelers are taking these goods out of the country. The Transportation Security Administration (TSA) rigorously enforces its regulations pertaining to transportation of liquids, gels and aerosols in carry-on baggage. Any item containing more than 3.4 ounces (100 ml) of liquid, aerosol or gel must be transported in checked baggage once you arrive in the US. 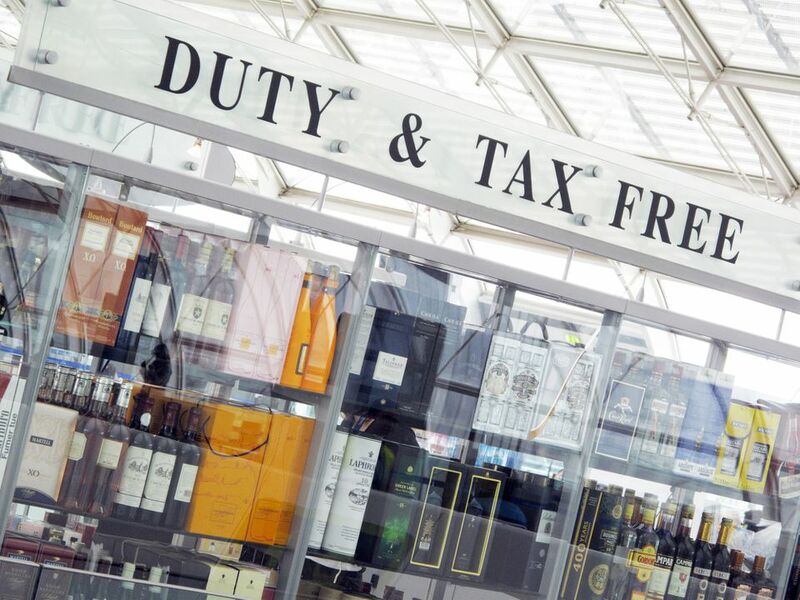 This means that you can purchase duty free liquid items, such as perfume or liquor, at a duty free shop outside the US and put them in your carry-on baggage for the international leg of your trip only. If you are changing planes in the US, you will need to put any liquid or gel duty free items in containers larger than 3.4 ounces (100 milliliters) in your checked baggage after you clear customs at your point of entry. However, if you buy the items at a duty free shop outside the US, they are in transparent containers and the shop has packaged the bottles in an official tamper-evident, secure bag, you can keep them in your carry-on bag all the way to your US destination even if they are larger than 3.4 ounces (100 ml). You must carry the receipt for this purchase with you on all legs of your flight, and the duty free items must have been purchased within the last 48 hours. The TSA changed this rule to permit use of secure, tamper-evident bags in August 2014. Where Should You Buy Your Duty Free Liquors and Perfumes? You will not be able to bring duty free liquors or perfumes in containers larger than 3.4 ounces / 100 milliliters through a TSA security screening checkpoint in the US, and similar conditions apply in many other countries, including Canada, Australia and the United Kingdom. Instead, go through the security checkpoint, and then buy duty free items once you are in the secure area of the airport. Be sure the items are packaged in tamper-evident security bags before you leave the duty free shop. For example, a traveler flying from Cancún, Mexico, to Baltimore, Maryland via Atlanta's Hartsfield-Jackson International Airport could purchase duty free items in the Cancún International Airport's shopping area and take these items to Atlanta in a carry-on bag. Once that passenger clears customs in Atlanta, any liquid, gel or aerosol items in containers larger than 3.4 ounces purchased at a duty free shop will need to be placed in a checked bag before the passenger boards the flight to Baltimore unless the bag containing the duty free items is secure and tamper-evident. If the bag does not meet these requirements, TSA officials will confiscate the bottles. Placing bottles of duty free liquor or perfume in your checked baggage could be risky, for obvious reasons. However, planning ahead and packing a few useful items as you prepare for your trip can help you minimize the risk of having a bottle break inside your checked bag. Bring wrapping materials, such as packing tape and plastic grocery bags, to secure breakable bottles. For maximum security, pack an old towel; you can use it to wrap wine, perfume or liquor bottles. Once you have wrapped the bottles, put them in the middle of your suitcase so that a direct blow to the outside of your bag will not break them. To be even safer, place glass bottles in at least two plastic bags, wrap the bundle in a towel, place that bundle in yet another plastic bag, and pack the plastic-covered bundle in the center of your largest suitcase. Pack washable items around the bundle, just in case the bottle breaks. Alternatively, you can purchase protective packaging, such as the WineSkin or BottleWise bag, before your trip. Use one of these commercial products, available at many US liquor stores and online, to seal your liquor bottles in cushioned plastic wrapping. Again, placing the wrapped bottles in the center of your suitcase will help protect them from breakage.